Many financial measures and ratios assist in evaluating the financial health of a business. Not one of those measures itself can assess the overall financial condition of a farm business. It takes a top down review of many of those measures and ratios to make an overall assessment of a farms financial health. See the website of the Farm Financial Standards Council for more information about measuring the financial health of a farm operation (www.ffsc.org). A farm financial consultant well versed in evaluating farm financial health is invaluable in assessing your farms financial health. This article considers only one of those measures, Capital Debt Repayment Capacity (CDRC), as a means to assess the financial health of a farm business. Capital Debt Repayment Capacity is calculated using select financial information found on the cash flow statement and the accrual income statement. The term CDRC refers to the borrowers’ ability to repay term debt in a timely manner. Typically, CDRC is not considered a measurement of a farm or business’ performance since CDRC includes non-farm/off-farm sources of income in calculating the repayment ability. The CDRC formula calculates the dollars generated from farm and non-farm sources available to pay debt on time and to pay for capital purchases. CDRC is measured as an absolute dollar value and is difficult to compare among farm operations. Graph 1 depicts the average CDRC of a group of Illinois FBFM farms enrolled in any one of the years for the period from 1995 to 2016. These farms are predominantly grains farm but livestock farms are also included. All lease types are also included. Farm size is limited to those over 500 acres with no limit on the farm size in acres, number of animals or revenue generated. 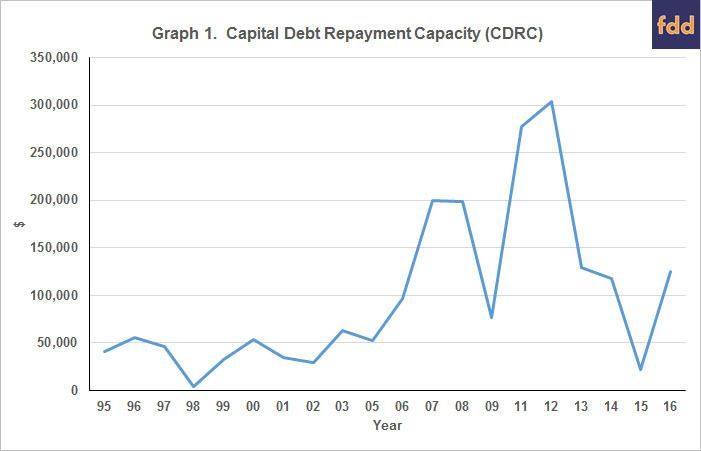 From 1995 to 2005 the CDRC moved in a relatively narrow range between $0 and $100,000 without much of a trend evident. The ethanol mandate becomes apparent in the period from 2006 to 2016 with a generally higher level of CDRC but one that is much more volatile. The volatility of the 2006-2016 period is approximately four times the volatility of the 1995-2005 period. This volatility coincides with a period of commodity price change, a general increase in the number of cash rented acres and a general increase in cash rent paid per acre. The volatility is also visible in the low level of CDRC for 2009 (late and wet harvest with lower yields) to the much higher level of CDRC of 2012 brought on by the dry year, low yields and significant crop insurance indemnity payments. Monitor your CDRC closely to maintain a good handle on your farms ability to meet debt payments on intermediate and long term loans. To the extent that your CDRC is in excess of those debt payments, you have the ability to acquire added capital assets.